We'd be happy to hear your feedback! 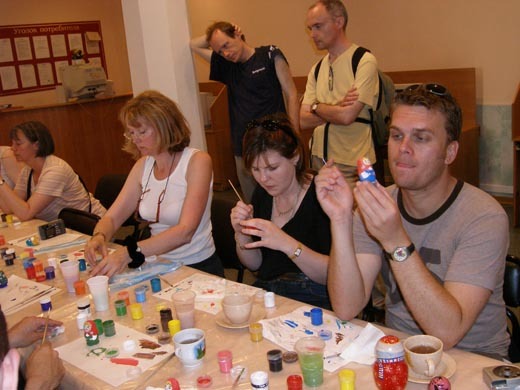 Your Moscow experience is very interesting for us and may appear useful for the future newcomers. You're welcome to leave a comment on your Moscow tour guide. The tour with Maria was absolutely fantastic!! We loved every minute of the tour! It was so great to see all the places we had seen in pictures and heard about. Maria told us not only the history, but also the social commentary and stories and all sorts of interesting things about the places we passed by. We can't wait to come back to Russia and see more! It was so special to see so many famous historical sights. I can't thank you enough for taking the time to help us with everything, I know I drove you crazy with all the emails, so thank you!!! I have attached a picture of me and my mom enjoying the sites. The services that Bridge to Moscow provided to us were invaluable. Before I set off on the trip, Katerina communicated with me by email, offering advice on finding accommodations and getting a visa. She helped me buy theater tickets and advised me to get the Russian telecommunications company SIM card that kept my cell phone working when the made-in-USA global data plan I had purchased failed. After I arrived in Moscow, Katerina kept in touch, sending me reminders of scheduled tour dates and tips about what was happening in the city. She recruited fellow Bridge to Moscow guide Mikhail Kazbekov to give me a tour in Russian of the VDNKh, (the sprawling Soviet-era exhibition area in the Ostankinsky District), the Museum of Cosmonautics, and the Park of Fallen Idols. She took my wife and me on tours in English of the Kremlin, where her father had worked as a museum administrator, and Sergiev-Posad, the Golden Ring city closest to Moscow that’s home to a 500-year-old monastery. 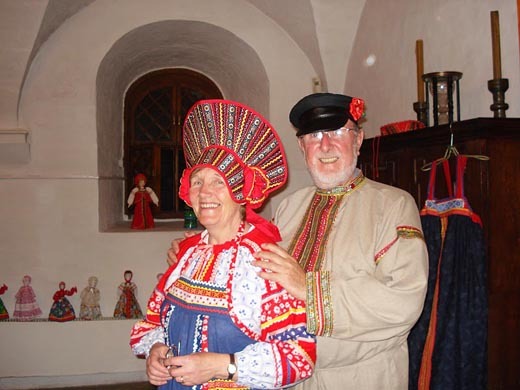 Through it all, Katerina and Mikhail provided service that was warm and personal, offered detailed knowledge of the sites we were visiting, and enabled us and the Russian we encountered to develop an almost instant rapport. Our trip was great and Alesya made it even better! She is a great professional, talented, good humored and her explanations added much value to our trip. I am sure that I will recommend Bridge to Moscow to my friends with a special recommendation about Alesya. Thank you so much for making my time in Moscow so wonderful! Katerina, I made it back here to the hotel without any trouble! I thoroughly enjoyed the Pushkin. But most of all I enjoyed my time with you. Thank you for sharing so much of Moscow and Russian history with me. You are most welcome to visit with me in Durham, North Carolina! I like the tours very much and will recomend Bridgetomoscow to everyone. All of the tour guides were very good in some way and different from one another. Maria was very sweet in taking me to the flea market and even negotiating with me the price of the camera I wanted to buy for my son. She is a real treasure. It´s a pity that Katerina was ill, but it gave me the opportunity to get to know more guides! Thank you very much for the wonderfull days! Yes, I REALLY enjoyed my tour with Natalia. She was super nice and provided a lot of background on the various sites. She was patient and willing to answer my many questions. I really really enjoyed the tour with her. I highly recommend her services and your tour. I'm going to write a positive review for your company on the TravelAdvisor.com web site. Wish you all a happy, healthy & prosperous 2014. We enjoyed our trip to Moscow. Katerina did a wonderful job. We felt bad for all the headache caused. Give us a ring if you're in San Francisco. We're happy to give you a tour. Take good care & keep in touch. I absolutely enjoyed my tour with Maria. I appreciate accommodating my last minute request! I'll be in Moscow several times a year, so you will definitely hear from me again. We did enjoy our tour with Maria. We liked the different things that we visited during the day and she did a good job sharing information about the history and background. 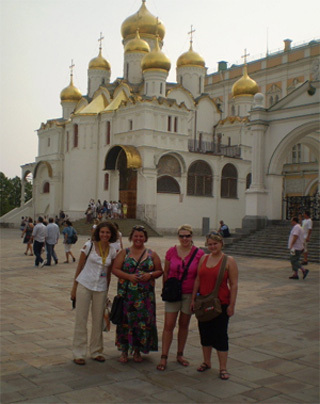 I would recommend Maria to anyone that is interested in taking a tour of Moscow. Thank you again for the excellent organization of our city tour in Moscow. We were very satisfied. Natalia was a very good and competent tour guide, with a lot of heart and charm us all wishes fulfilled and answered all questions. We have felt ourselves very well and can Natalia as well as your organization only warmly recommend! Thank you for setting up the last minute tour on 14 September 2013. Elena was really knowledgeable and tried her best to accommodate all my friends' interest. The only "bad" thing that was beyond anyone's control was the weather and it was a pity we could not enjoy the skyline of Moscow that day. Maria took us on the 16 September 2013 tour to the Metro and the Kremlin. All of us thought she was great and timed everything to the tee but we never felt rushed at all. We really enjoyed everything Katerina was able to show us during our short stay in Moscow. We would not hesitate to recommend your company. I intend to write a very positive review on Tripadvisor as soon as I have a few minutes. We had a wonderful day with Katerina. She did a great job of guiding and interpreting. I would highly recommend her to others. Sorry I didn't get back to you sooner. We both really enjoyed the tour and thought Svetlana was great. I could tell that Svetlana really listened to us when we talked and went out of her way to make us happy. She also was very patient with my husband who at times can let little things get to him. For example when we went to lunch she at one of the smorgasbord type restaurants she made sure that he was served items that he would enjoy and when there was a communication problem with what he wanted with one of the servers, she stepped in and took care of him. Svetlana was also very knowledgable about the city and Russian history. Her stories and information made our experience much richer and satisfying than it would have been on our own. 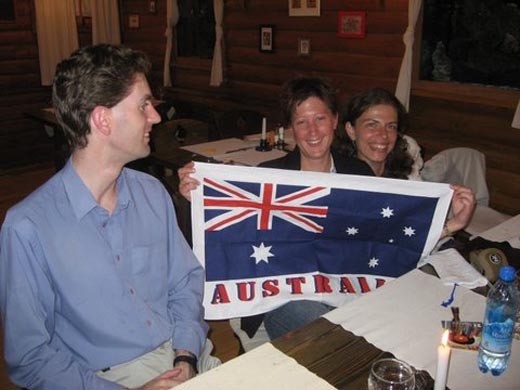 I would highly recommend your company and Svetlana to other travelers to Russia. Прошу извинить за задержку с ответом. Возвращение на работу после длительной поездки всегда сопровождается цейтнотом, из которого я только-только выбираюсь. Нашей команде Очень понравились ваши экскурсии. Я слышал исключительно восторженные отзывы о работе Светланы и Анны. Всё было очень информативно, интересно и захватывающе. В нашей группе было два человека, которые много поездили по миру и видели огромное количество экскурсоводов. Так вот и Светлана, и Анна произвели на них очень сильное впечатление своим профессионализмом, любовью к российской истории, умением работать с экскурсантами и энтузиазмом. Наши "бывалые" говорили, что такого трепетного отношения и любви к истории родной страны они не встречали больше нигде. Одним словом: все было просто замечательно. Будем однозначно рекомендовать вашу фирму всем своим знакомым. Thank you very much for all your help. The tours were excellent and both Maria and Katerina are thoughtful, knowledgeable and very pleasant guides. We enjoyed our tours very much. 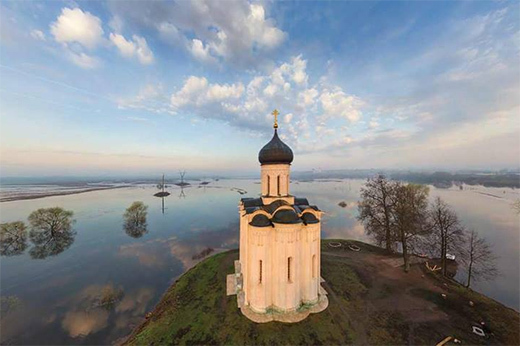 I think taking the Sapsen train to go to Vladimir for the Vladimir-Suzdal is the most convenient option and we found that the 6.45am out and 4.50pm return train option is more than adequate to cover all the major sights in Vladimir and Suzdal (of course with a private car and driver from Vladimir). You may recommend this option to other guests. One small feedback: You may indicate in the itinarary in your website that for the Kremlin tour, tours for the Armoury and the Diamond Fund should be requested in advance separately. We forgot about that and just managed a short tour of the Diamond Fund after the Kremlin churches. I think many tourist may also be interested to see the Armoury when they go to the Kremlin. 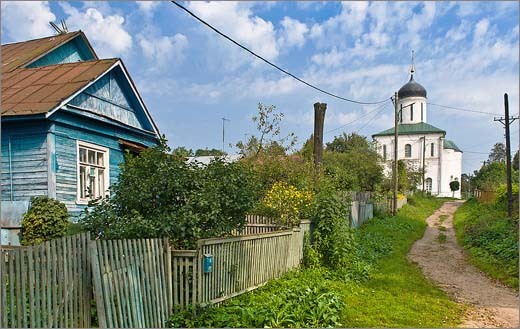 We had an informative and enjoyable tour of Suzdal and Vladimir. Our guide, Natalya, was very knowledgeable and helpful; Nikolay, the driver, spoke good English, was a skilled driver and had a comfortable car. From our family to Bridge to Moscow, spasiba for organizing this wonderful tour. We loved our tour with Katerina. She was fantastic. Very knowledgeable, patient and helpful. I will be happy to recommend her and the company at large to everyone I know. Thanks for a wonderful experience. we have spent 2 beautiful days with Sergey in Moscow, I think that we couldn't have a better guide. Everything has been very good for us. I am sorry for such a late answer. The tour was amazing and you live in a wonderful country. Katerina was a terrific, professional and very special guide. 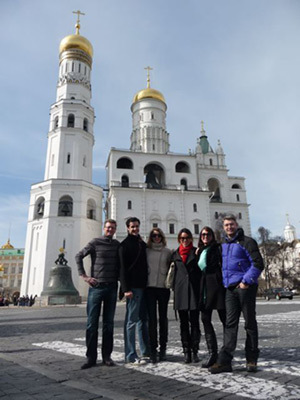 This was our first time in Moscow, but not our last time, and Katerina will be our guide. I will recommend your services to anyone who travels to Moscow. Thanks again for all your interest. We did very much thank you. I just wanted you to know that I really enjoyed the tour of Moscow with Irina. She was very informative and a pleasant guide. While it's unlikely, if I ever get back to Moscow, I'll contact you again for another tour. We are back in Vancouver after 3 weeks travel. Both the tours we did with Michail were great. We enjoyed spending time with Michail as well as the guiding and will happily recommend your services. The bike tour went very well and showed us a very nice side of your city. We would love to return for another visit. I just want to write and say how pleased I was with everything that you fixed up for me. The car pick up worked perfectly from Domodedovo airport and I had a lovely day with Ludmila on Sunday 19 May. We got on well together and she made my first introduction to your wonderful city a very pleasant experience. Ann, a colleague on the course, fixed a car for us both on 26 May and this worked perfectly too. I think we were also able to put a bit more car business in your way as we passed on the Bridge Moscow details to two more colleagues who were staying at the Metropole Hotel and wanted to be taken to the airport. If I ever have the opportunity to visit Moscow again I will certainly contact you. Thanks for your mail, we enjoyed our tour of the Kremlin with Masha, she was so knowledgeable and helpful. We would recommend your services again to our friends and families. Please extend our best wishes to Masha. I just wanted to thank you again for all your time. Even with the need to cancel today, Mike and I had a wonderful time seeing your beautiful city. I appreciate all your work to make our trip so pleasant. Sorry for the late answer. We were travelling and I had limited access to my email. I would like to thank you for the perfectly organized Kremlin tour. We have learned a lot about history of Russia, Moscow and Kremlin. Our guide Maria shared with us a part of her vast knowledge about your beautiful town, its history and places. We really enjoyed Maria's company, were very impressed and grateful for her engagement and kindness. In particular we enjoyed the visit to the Armory Chamber. Thanks to Maria, we travelled though the Tsars' times and understood beauty and meaning of the displayed objects. It was fascinating. Also the churches were absolutely gorgeous! Maria's informative comments helped us to find most interesting, unique and precious frescoes and Icons. 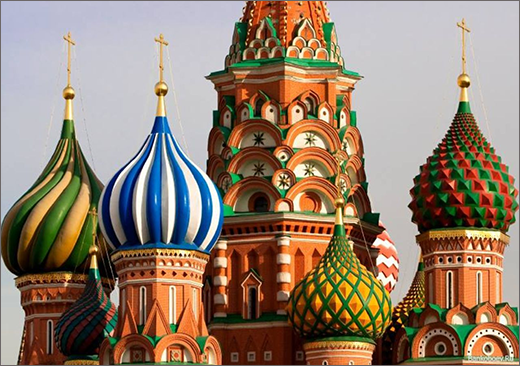 We will certainly recommend Bridge to Moscow and particularly Maria to any of our friends and everybody who is travelling to Moscow may need a tour guide or any individualized service. And was a delightful person. We had a marvellous time with Daniel, whom we found to be a very intelligent and sensitive guide. He was kind enough to take us to his apartment and responded to our questions in a very informative and frank manner. We enjoyed every moment and wish we had been able to spend more time with him. Thank you very much for your prompt and efficient service. I will post a review on Trip Advisor as soon as possible. I would like to thank you for organising our 3 days in Moscow last September. 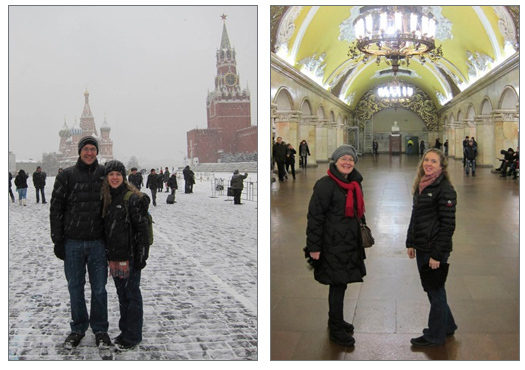 My husband and 2 daughters had a most fantastic time in Moscow. We found the whole experience was so relaxing and most enjoyable. We believe the organisation from yourself attributed to the fantastic family time we had, hassle free. Our 2 guides Mikhael and Marie should both be commended on the way they conducted our days activities. They always kept in mind our needs and interest while making sure we experienced the wonderful sights of Moscow. Their knowledge and friendliness was greatly appreciated by all of us. We all left Moscow believing what a wonderful, interesting city Moscow is, hoping to return someday. Could you please pass on our sincere thanks and appreciation to Mikhael and Maria for our most memoriable time in Moscow. Yes, we had a wonderful and well organised tour to the Kremlin, Red Square by our guide Maria. She was very informative and gave a good historical guide to the Tsars that occupied the Kremlin without being boring. 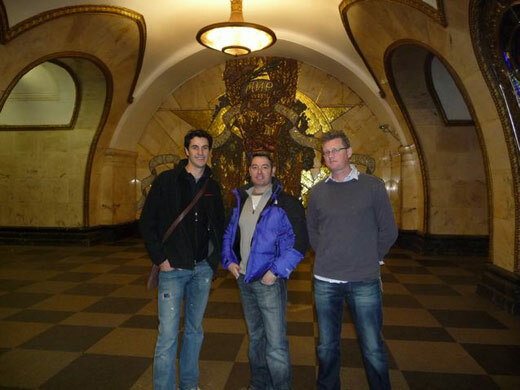 The moscow subway tour was also very informative and interesting. Gave us confidence to take some trips on our own the next day.We also enjoyed the drive around tour of Moscow, it was a good way to see life in Moscow outside of the main city area and worth spending the time and money, plus, so much easier than taking the public transport. The services you offered and concretely Elena had been completely perfect!! The organization had been perfect as well as Elena's explications. We are very happy with your company and we'll recommend to our colleagues. We also enjoyed a lot the city and we're in love with the Red Square in the night. Hope you have a good new year's eve. We want to tell you how much we enjoyed our stay in Moscow. What a wonderful city it is and we could not have wished for a better guide than Mikhail. His knowledge of the Russian history and just about every buildingof significance (and the Metro!) was truly amazing. He also gavemuch more of his time than was expected, answered all our neverending questions patiently and is such a pleasant person. We weresad to say goodbye to him because by the end of the time we spent together, he really felt like a friend to us. Further more we wish to express our appreciation for the excellentservice we got from you, Anna. Your replies to our requests were always punctual, professional and informative. meet up with you again. We just wanted to write and say thank you for the great experience we had in Moscow. Olga was a great guide. She was very knowledgeable about the History and sights of Moscow and was able to share her knowledge in a very interesting and enjoyable manner. We wish you all the best for your business, Bridge to Moscow, and we will be happy to post a good review on Trip Advisor to advertise your business when we get the time! inform you of what a wonderful time we had visiting Moscow and St. Petersburg. I was glad to get to meet you (briefly) at the Kremlin. Mikhail was an exceptional guide and we made a great connection with him. and skills as a guide. Our tour was great - Maria was fabulous. She was punctual and tailored the tour to what we wanted to see. She was very knowledgeable about Russian history, and her knowledge of modern architecture was also great. We would definitely recommend using your company to others when they visit Moscow. Thank you so much for recommending Bridge to Moscow and Anna. My 3 days of tours here have been fantastic. Anna is charming and so knowledgeable. My tours were complete and I always felt that I was getting extra "inside" information. Yesterday, while we were at the Kremlin, Anna and I ran into another one of her guides, Mikhail, and an American couple in his charge. The Americans raved about Mikhail…just as I rave about Anna. I can absolutely recommend her and her team to any of your other clients who may need individualized service in Moscow. THANK YOU again for the wonderful time you shared with us in Moscow! We will always remember our time together and the effortless skills you shared with us. Enjoy the attached photo. wanted to thank you for the tour you provided while we were in Moscow. very interesting and made the trip so much more special. around our part of the world. 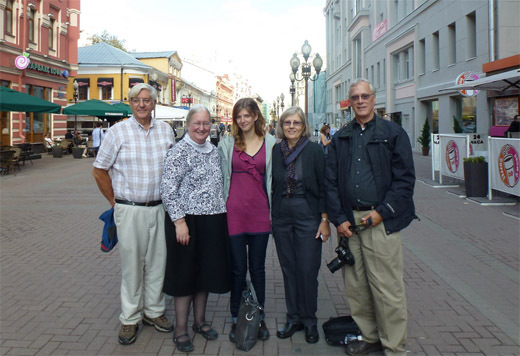 We spent two full days in Moscow, September 2012. Katerina was our guide and she did an outstanding job. Her intelligence,expertise and energy coupled with her warm delightful personality made our visit memorable. We had two unpredictable personal"calamities" and Katrina managed prompt resolution in a calm reassuring manner. All went well with Irina. It was a good choice you made. She made the tour interesting and fun. Thank you and tell Irina I had a great time. I enjoyed the tour with Maria. She was very knowledgeable and flexible to my needs. The information I gained and the sites visited were definitely worth it. Maria is focused in sharing the history of the sites/people and balanced it with current events that were interesting. She is engaging throughout the tour and really appreciated her. Dear Anna, Natalie and I want you to know what a wonderful trip to Moscow you and your staff were able to provide for us. Despite a few errors on my part in booking and departing, everything went smoothly because you and your staff were so efficient. Special praise to Mikhail Kazbekov who is not only remarkably knowledgeable but equally hospitable and accommodating. Great praise as well for Genady,,our patient and careful driver who retuned my camera forgotten in his car in record time and in terrible traffic. If given the opportunity to recommend you to others it will be our great pleasure to do so. All the best, and thanks. We would like to thank you for a most enjoyable tour of Moscow. Thank you again for making our time in Moscow so pleasurable. Our tours were great, thank you for all your assistance! We did find Stalin's bunker, but you were right, it was very difficult. Luckily we left early. The tour guide there was funny, he had a very Russia centered perspective on history that Ethan and I found very interesting. Michail was also a wonderful guide (he was very friendly), I really enjoyed the tour of the Kremlin and getting to see all the relics from Tsarist Russia. What I enjoyed most from the tours was being able to walk around downtown and having all the different monuments and sights pointed out and seeing the different relics that have been left behind with time. Ethan and I both think Moscow is a beautiful city and one of the best places we have visited. The only problem is that it is difficult to get around the city without speaking Russian, but that is why having the tours was so helpful. Hopefully we will be able to return sometime in the future and we can see all the other sites as well. Ludmila was wonderful! We would recommend Bridge to Moscow to anyone. We enjoyed the Armoury, which you arranged for us, very much. Thank you for everything. I just would like to say thank you for an excellent guiding provided by Bella for the last two days. She was nice and insightful, and gave me a good introduction to the city. Both guides (Ludmila and Olga) were wonderful and very knowledgeable. We enjoyed them, and they did a good job keeping the children's attention which is not easy. You yourself have been wonderfully helpful and easy to deal with. I would highly recommend your service to anyone. Thank you! 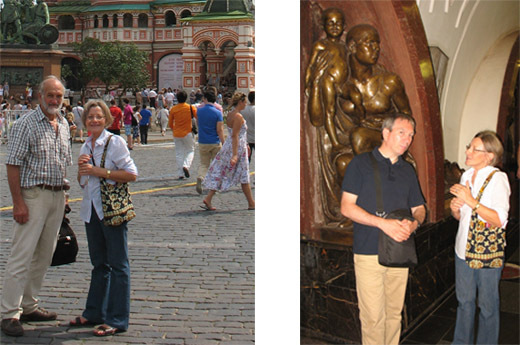 My wife and I really enjoyed visiting various sights of Moscow with your service. Elena is an excellent guide. She explained and provided all the details necessary to understand the various sights. She identified various important buildings. At the art gallery, her explanation helped us appreciate the various works. She helped us with Russian food. She showed us the Metro really good. We are thankful that she was our guide. Mr. Driver was good too - driving and parking the car at various locations without any problem. Thank you so much for arranging the tour. Thank you for your assistance in planning and guiding us in Moscow. We had an interesting 10 days in Russia, which gave us a new perspective of the country and people, apart from the beautiful and unique architecture of the cathedrals and museums. The Kremlin is especially memorable. The Kremlin we were told by western media is 'dark and threatening' but what we saw is humane and artistic. We now have a better understanding of Russia. Special thanks to Katerina for your patience with this group of senior (old) folks who can't walk very fast :-) Also, your knowledge of the historical background of the places we visited made them come to life. We are very pleased with Bridge to Moscow and would recommend our friends to use your services. we had a great day with Irina. She was organised, knowledgeable, kept us on the move and some how got us to everywhere we wanted to go. She was fun and very easy to be with, we would recommend her to anybody. Altogether she was brilliant. The driver was patient with us and more important with the moscow traffic, looked after us very well. i just want to say again how great ur company and ur personal touch is, i really felt u are taking care of us. And about our guide Mikhail, well no matter how much i say it wont be enough he was great! i really feel great future for this company and wish u all the best! I really enjoyed the tour! Katerina was a great guide and a very nice person! She was very knowledgeable of all the sites and also other topics we talk about! 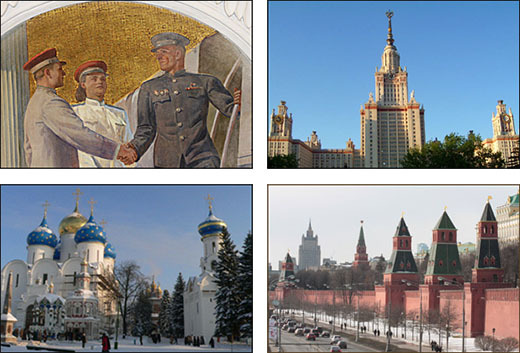 Moscow is an amazing city rich in culture and history! Thank you for such a great service!! 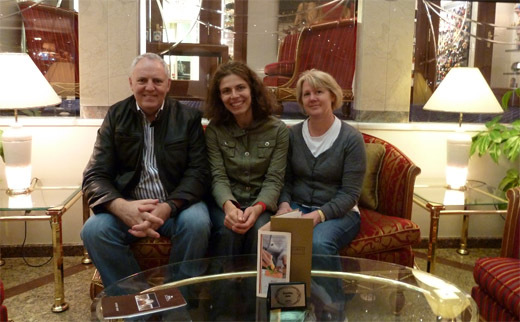 Thanks to Annemarie Jurrius and your organization we had a fantastic stay in Moskou. We very much enjoyed the guided tour by Bella on the 26th en very much enjoyed the tour around Moskou on the 27th by Mikhail who inspired us a lot with his knowledge and enthusiastic stories about the beautiful buildings and history of your country. Not to forget his beautiful spoken English. Mikhail could not have been a better guide. He was extremely knowledgeable, kind, and fun to be with. He was also really flexible. For example, as he got to know more about us and our interests, he altered the itinerary in favor of things he figured we would be more interested in. He was right on target every time. We especially appreciated how organized he was. For example, he got our tickets for the Kremlin in advance so that, even though the Kremlin ticket office was closed that day due to some government event, they had to let us in because we already had our tickets. We were very impressed by that; otherwise we would have visited Moscow and not have been able to see inside the Kremlin. Mikhail is a highly intelligent and cultivated individual, but he is also very warm and a pleasure to spend time with. He treated us extremely well and is a person we would love to know as a friend. All told, I would give the entire experience an A+. Thank you for all of your help as well. The drivers were excellent and the transfers on time and extremely helpful. And Olga definitely made our time in Moscow very special. She worried about our comfort and well-being and it was much appreciated. Anna - just wanted to put in a good word about our guide, Mikhail, for our tour today. He is an excellent guide, attentive to our needs , full of Russian history, and speaks excellent English. What more can I say - he is one of the best. Mikhail and the service provided were excellent. oh yes he brought good weather. The driver , whose name escapes me [ apologies ] was there close at hand when needed and safe. All in all a great few days of which our day with you was the highlight. We had a wonderful tour of the Kremlin. Daria was superb. All of us found her imformative, informal, informed and just great to be with. It speaks a lot of the personnel your team has. we would have loved to meet you too amd say thanks for maling our trip to the kremlin so enjoyable. We are so glad we connected with Bridge to Moscow. It was our first time in Russia and we were unsure what tour to use. Anna responded so quickly and was so professional, we decided to use their services. Listing what we wanted to see in 3 days, Anna was able to put together a great itenerary. Then we were fortunate to meet Mikhail! He was so much more than just a guide. Personable, outgoing, discussing much more than the usual tour info. And he is passionate about his charity as well. We would recommend Bridge to Moscow highly, without hesitation!!! Thank you again! Irina Chulkova was our guide for two days in Moscow, and we had a wonderful time. She is extremely knowledgeable about everything we saw. She was quickly able to figure out what kinds of things we liked and showed us many out-of-the-way places as well. We would recommend her highly to anyone. She also tells very good jokes. We would gladly choose her again next time we are in town. I just wanted to write a quick note to say thank you! We had a wonderful trip and the weather was perfect, just what I would have hoped to have in Moscow in December! Irina was fantastic guide and she became a friend. She was knowledgable, friendly and fun and we truly enjoyed our time with her! I know that we could have navigated at least some of our sightseeing on our own but we would not have seen nearly as much nor would we have learned as much without her. Irina made our trip fantastic! It was also great to get that local perspective that otherwise would have been missing from our trip. We would, and have already, highly recommended her and your service to our friends and family should they choose to visit Moscow. As far as our itinerary goes, day one and two were fantastic. The only thing I am not sure I would repeat would be the bunker but I did enjoy the tour. I was really looking for the Cold War/Soviet flavor and certainly found it! Thanks for your help in building a plan that insured we would see the most we could in our short time in Moscow! Thank you for arranging the tour of Moscow for us. It was all we could have asked for. You did a great job setting it up for us and matching us with Michail. We will certainly recommend your services to our friends and colleagues. Thanks again. The tour was excellent. Olga and Yuri did wonderful jobs of showing us everything we wanted to see in Moscow and more. We would definitely use your services again and recommend you to anyone planning a visit. My visit to Russia, specially to Moscow, was great. Not only in relation to work. I just loved the city. To a great extend, much of the success of my trip has to be credited to Ignat. I just can't express how grateful I am to have had him working with me during my stay in Moscow. Besides all the help he gave me as a guide and interpreter, he is a great guy and gave me a precious hand in schedulling interviews, suggesting names to be part of my report and giving me some important insights about the country. I certainly would not have been able to do half of what I did in Moscow if it wasn't for him. I'm very greateful to you too, Anna, for having understood my needs suggesting Ignat to work with me there. Ignat has told me about writing something on your website about your agency and I'll certainly do that. It will take a few days yet, as I'm totally envolved with my article about Russia right now. But I'll do with great pleasure. Many thanks for everything. Please, send greetings to Ignat! We enjoyed our tour immensely despite the rather horrible weather. It's unfortunate that the red square was closed today due to the election but Mikhail did a wonderful job. He's been exceptionally patient and very knowledgeable, we all like him very much and appreciate his efforts. Thank you very much, we had a brilliant tour. Mikhail was fantastic - he was very knowledgeable, professional but almost knew where exactly to take us - like he know what sort of things we would like to see and do. He was very precise and also made the tour really easy (I had a small baby and pram with me). Michael is a very special guide!!! He is an expert in an incredible number of areas - history, art, architecture, literature, politics and culture. 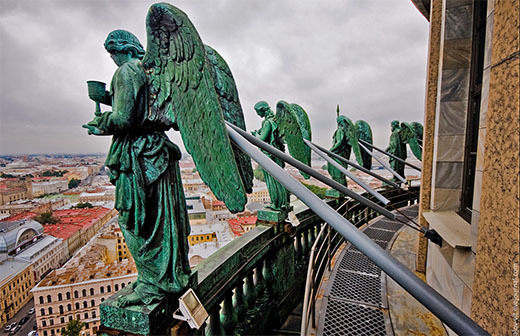 For example, when visiting Kremlin with Michael we visited Archangel's Cathedral. 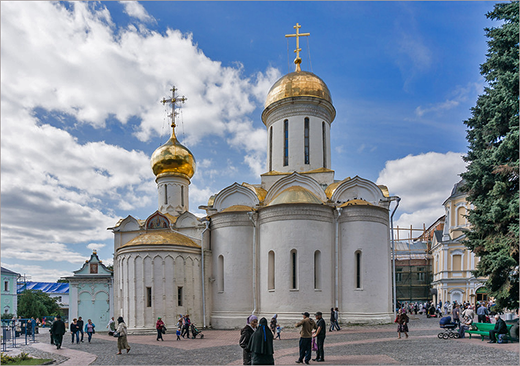 Micheal told of the Italian architect Aleviz Fryazin Noviy; how the Cathedral was not only a burial place of Moscow Princes and Tsars, but also the relics of St. Prince Michael Chernigovcky murdered in the Golden Horde in 1254, and also the relics of Tsarevich Dmitry, the younger son of Ivan the Terrible. He gave the story behind all the beautiful icons filling the walls. He then described how it became a museum and then reverted back to a church. I only wish we had more time to spend! Originally, we picked BridgeToMoscow because they responded very quickly and professionally. Anna, the contact person, asked our needs and immediately put us in contact with guide Michael. 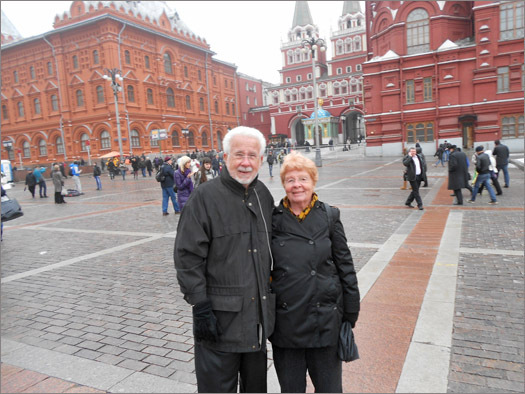 We were travelling in Moscow with our two mothers - a Russian and 79 year old American. They not only needed a description in both languages, they also needed help to get around. All these things Michael was able to provide with pleasure. 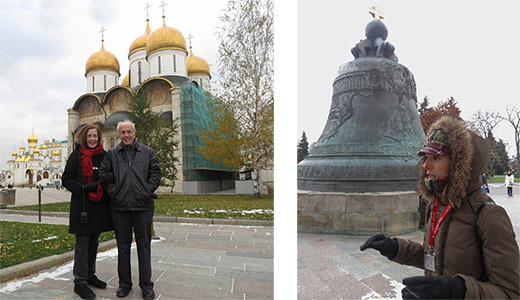 He picked us up from the hotel and provided a tour of central Moscow on the first day and a visit to the historical part of the city (Tzaritsino and Kolomenskoe) by car on the second day. Our mothers were both very happy and fond of Michael. I would also like to add that Michael is involved with charity work for the famous Children Hospital in Moscow . He is not only an excellent tour guide, but a big kind-hearted man. I gladly recommend Michael to anyone visiting Moscow!! Bob, Oxana, Ruth and Tatyana. Mikhail was possibly the best tour guide I've ever had & he greatly exceeded my expectations. When I return to Moscow with my wife (hopefully next year) I will definitely make use of your services again & request Mikhail as my guide. I am writing this email to tell you how wonderful your guide Mikhail was during my visit to Moscow. He was VERY knowledgeable , patient with my questions, and very informative about Russian history and art. Your tour company is very fortunate to have him on your staff. Thanks to him and your tour company, I had the trip of a lifetime in Moscow. Thanks again ! 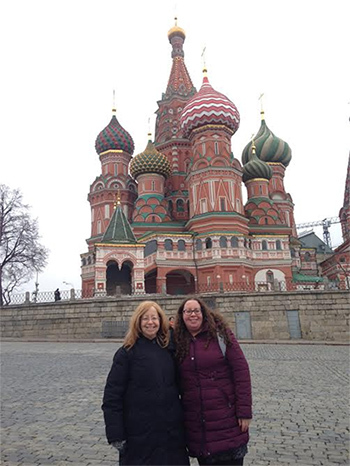 We just returned from our trip, and I wanted to let you know that Mikhail did a great job showing us around Moscow and covering the places we wanted to see. He was very informative, timely, and flexible. His english was very good, and we enjoyed his company very much. He allowed us to cover everything we wanted to see in the short time we were there. I am safely home. I enjoyed very much Moscow. Is it an exaggeration to say that I have never enjoyed a trip so much in my life? It was mainly because I was able to see in three state museum's Varvara's work from their archives and interview Irina Kojevnilova, the biographer of Varvara. But all this would not have been possible without your initiative to contact these museums successfully. You are remarkable in your sensitivity and intelligence, taking time to understand and helping to realize a stranger's dreams during this trip. Mikhail was also stupendous. No doubt his intelligence and courtesy contributed to my being received so cordially in the state museums and by Irina. Within a very short time, he showed me many important sites in Moscow, including the Kremlin, Armory, Churches, museums, metro and the streets of Moscow. I enjoyed very much our discussions on the history, culture and the political and economic changes in Russia. Finally his help was invaluable to identify good books on Soviet foreign policy that my husband needed. Just wanted to say thank you for your guiding services on my recent trip to Moscow. I very much enjoyed my time. I have never had such a knowledgeable guide before. Congratulations on the quality of your service and best wishes to you for the future. Oleg was great. His knowledge of Russian history and landmarks was very informative. The fact that he enjoys learning more about the subject on his own certainly added to our experience of the city. He was very helpful in getting the bags making numerous calls over two days. He showed up promptly and always told us what the daily schedule was and then worked with our changes. Roz fell down some stairs the day before we left so her back was very sore and we had to rest and even omitted Ostankinko because of her pain. We would certainly use your services again and recommend to others. Thanks for making the arrangements. The tours from the boat were quite a contrast with the group not nearly as fun as Oleg. I wanted to thank you for organizing the Moscow tour for us. Everything went smoothly, starting from our arrival at the airport until our departure at the train station. Irina is a wonderful guide, and my family and I enjoyed her company. She is extremely knowledgeable, friendly, and accommodating, and she did a great job in showing us around. Yes, our tour was great. Irina was a wonderful guide and very patient and answering all our questions and requests. She even helped us at the end find things in the grocery store. The tour was very informative and definately helped us over the communication barrier. We would definately recommend Irina as a guide. Natalie was fantastic. We couldn't have asked for more. We have alot of experience with guides during our holidays and Natalie is definitely the best guide we have ever had. She knew so much and was so informative and so interesting too! We wanted lunch at a russian restaurant away from the tourists and Natalie kindly took us to a great local restaurant and the food was great. I would highly recommend Natalie to friends and will be writing a review on TripAdvisor shortly. We had a wonderful time in Moscow. We saw everything that we wanted to see including an opera at the Bolshoi. Oleg is an excellent guide. He is very well informed about the history of the sity, Russia and the art that we saw. He is a very pleasant gentleman with whom we spent 3 1/2 days. Our only complication concerned finding the correct track for our Saspan train to St. Petersburg. This was not his fault, but rather a lack of signs at the train station. Anna, I cannot speak highly enough of him and our experience.When we return, we would definitely like to spend our days with him. Hello Katerina, Thank you for providing great service, the trip was amazing and Mikhail Kazbekov fulfilled all my expectations about the great city of Moscow. He is very professional and knowledgeable; truly a gentleman. congratulations on organising such a wonderful winter tour of Moscow. Everything was flawlessly organised and well communicated prior to our arrival. Our children (Sam, 11, Jack, 8 and Kathryn, 7) loved your company and you coped admirably with all their questions, and even managed to get them in and out of the Metro stations without looking too stressed. I would urge anyone who is thinking of coming to Moscow to consider a winter break - it was cold - and you need warm, waterproof boots, but the snow and ice in the parks was beautiful and the Museums and Churches were almost empty so there was no lining up. Once inside Russian coat check ladies are the most efficient in the world! Thank you so much for making our 6 days in Moscow memorable, fun and stress free. As a family we have travelled to South America, Africa, America, Europe and Asia all with small children and I would say that your services were just perfect for us. 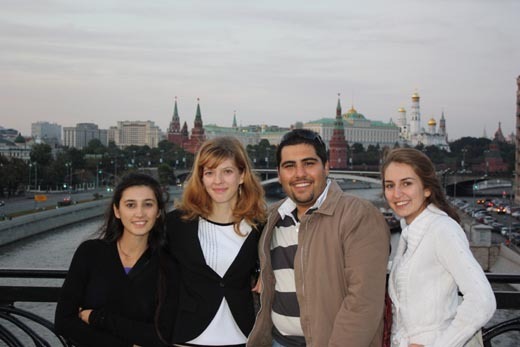 I would like to extend a huge thank you to you for your very professional assistance with my group''s visit to Moscow! A combination of interesting, patient, humorous and very informative – you really are the perfect guide. You made Moscow come alive for us and I, for one, left with a wealth of knowledge of your history, traditions and way of life. I also really enjoyed and appreciated you teaching us the Cyrillic alphabet! I will definitely recommend your services to other people visiting Moscow and have already sent your details to my travel agent so that they can recommend you. Thanks again and I hope your new venture is hugely successful! Well we are back in London and it all feels like a distant memory! Thank you for all your guidance, we really loved our time in Moscow! We really LOVED the circus- it was hilarrious and would definitely recommend it to anyone going.Thank you again for all your help. I hope you keep busy all year and if I know anyone is heading over I will pass on your details. I just wanted to thank you for being such an excellent tour guide - without you the trip would simply not have been the same.... We enjoyed your seemingly limitless knowledge of Moscow (and I particular enjoyed the visit to the Tretjakov Gallery to discover the fabulous icons by Rublev , which I would never have looked at otherwise), your charm and diplomacy even in tricky situations. I hope we will be in touch and you will show us all the other lovely parts of Moscow too. Can I give your name and email to a couple of friends who have been"jealous" of my experience in Moscow and may want to organize the same formula? was extremely helpful and willing to answer all our questions. The three days we spent with Anna were wonderful. Dear Anya, so many things to thank you for! Thank you for showing us your beautiful country, teaching us your varied history, keeping us safe and sharing your vodka and caviar culture. Spasibo! I would just like to say that my parents and I had a great time, and really enjoyed the week. I cannot praise Anja enough, she really is an outstanding leader and the whole group told me how great they thought she was. Her knowledge was very impressive, and her ability to look after the group was excellent. I hope that she will continue to look after the Exodus groups. G''day! Thanks for a top tour! Hope to see you down under soon! I wanted to let you know that I had a wonderful experience here today with the tour. Ignat did a fantastic job of showing me around, discussing items, answering questions, and helping me to get the most out of the day. It was cold, but we balanced out walking with getting inside at various times, so it was great. If others I know of are visiting here, I will certainly pass on your contact information. You''re welcome to contact us and share your impressions! 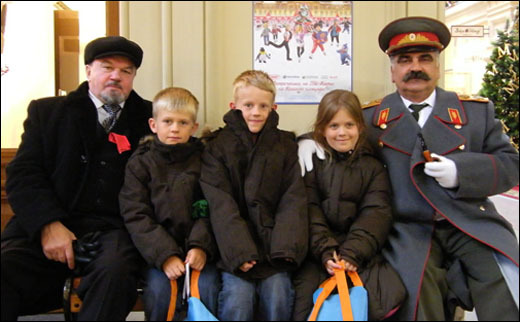 Any comment (positive or critical) on your Moscow tour guide will be highly welcomed.